How Durable Are Fiberglass Pools and How Long Do They Last? Today, we are going to discuss the latter, and share with you what we know about the durability of inground fiberglass swimming pools. Long before we began manufacturing fiberglass pools, we installed them (and still do). At the time of this writing, we at River Pools have installed over 1,000 inground fiberglass pools throughout Virginia and Maryland since our humble beginnings in 2001. Most of these pools were produced by many of the major fiberglass pool manufacturers in America. Based on our experience, this is all you need to know about the durability of fiberglass pools: if a fiberglass pool is manufactured, installed, and maintained correctly it will last many, many decades. In fact, many of the first fiberglass pools installed in the '60s and '70s are still fully functional today...and that was with antiquated methods and technologies! With that said, there are some variables that will determine the life expectancy of your fiberglass pool and definitely merit some research on your part. The reality is that not all fiberglass pools are created equal. We like to compare the building of a fiberglass pool to the making of a sandwich. Some of the differences between various fiberglass pool manufacturers are the quality of materials used, the laminate schedule (order and thickness of materials), the processes employed to apply each layer of laminate, the level of workmanship of the crew building the pool, and finally, the condition of the mold the pool is built on. Just as each link of a chain is the most important, each of these pillars of building a fiberglass pool must be at an optimum to ensure your pool stands the test of time. Because of our background as pool installers and because of the number of backyards we've had the opportunity to work in, we have a lot to say with regards to the proper installation of fiberglass pools...but only because our knowledge came at the cost of the painful experience of doing things the "wrong way" for many years. Notwithstanding, we managed to keep all of our customers happy by fixing virtually all the problems that arose during our first years in business. 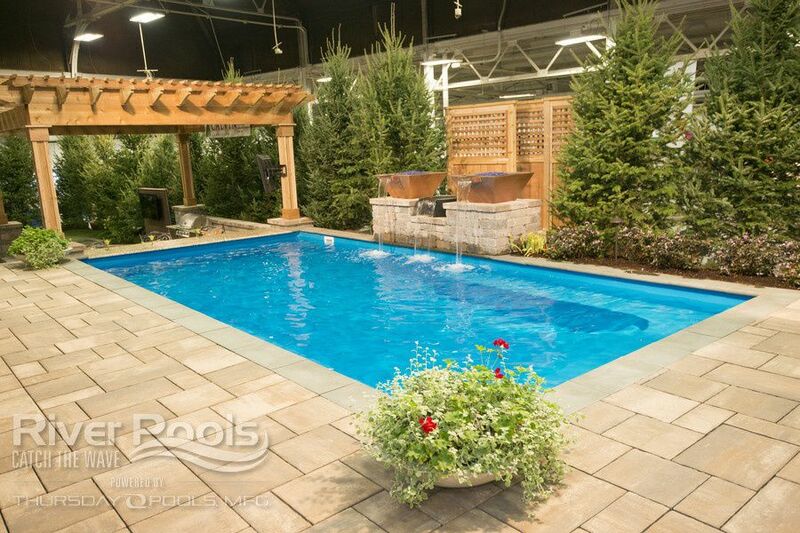 The by-product of this experience is our unique advanced installation methodology as part of The River Pools Way, which virtually eliminates the most common problems associated with fiberglass pool installations. Basically, pools installed using this methodology will not develop leaks or shift or settle in any way, and these are the core issues related to the installation of fiberglass pools that can impact the durability of the of the pool shell structure. If you live outside of Virginia or southern Maryland and are interested in having your pool installed using The River Pools Way technology, you can find a River Certified Dealer near you that has been trained and certified according to our standards. Have you ever stayed in the bathtub too long? Look at the impact just being in the water for an hour has on our bodies. And look at what happens to us when we get too much sun...ouch! Imagine for a second the life of a swimming pool, spending your entire life filled with the universal solvent while simultaneously being beaten upon by direct sunlight. Pools have it tough, but the reality is that many pool owners make a pool's life a lot tougher than it needs to be. With very little effort, a fiberglass pool can be properly maintained. But if neglected, the surface of any pool will be compromised and start to develop problems. I have seen 12- or 13-year-old fiberglass pools that look like the day they were installed. I have also seen 3- or 4-year-old pools produced by the same manufacturer and installed in the same way that if I didn't know better, I would guess were decades old because of owner neglect. The simple truth is that the pool manufacturer, the installer, and the pool owner all play equal roles in how long a fiberglass pool will last. It's our commitment to you that if you purchase a pool from us, we will do our part to ensure your pool is manufactured using the highest standards and installed using the best methodologies by our dealers. But you can learn how to maintain your fiberglass pool! With that said, I hope you've found this article helpful. Feel free to leave any questions or comments below. Editor's note: This blog article was updated on December 28, 2018.